Eat Your City: Vi's for Pies Edmonton, AB - homemade chicken pot pie, freshly baked chocolate cakes and of course pies! Vi's for Pies Edmonton, AB - homemade chicken pot pie, freshly baked chocolate cakes and of course pies! With a hankering for a down to earth homecooked meal and freshly baked treats - cakes, and pies and other delights, there was only one place we knew would fit the bill - Vi's for Pies! Its easy to miss as by the time you see the large vintage sign, you've already blasted past it. With a large display counter FULL of sinfully decadent cakes, pies and squares, we had to squelch down our inner child and have dinner first, followed by dessert. The dining room is small and cozy with tables around the fireplace which we gravitated to. Small enough for a date - for the young and more wise, the daily specials and the menu are posted on several large art easels which get trucked around the restaurant by the friendly waitstaff. But enough about the quaint ambiance.. we're here for the food! After waffling back and forth - there was so many comfort foods on the menu, it was difficult to choose, we order drinks before we continue trying to decide what to eat so we could still save room for dessert. 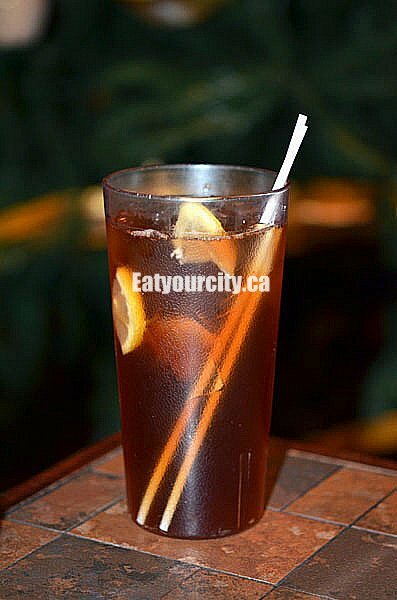 To go with some in house smoked ribs, got the Cactus fruit iced tea which unfortunately was completely lacking in cactus fruit flavor, but was a nice well brewed (and cooled) strong tea with lots of tannins. Given a squirt of lemon, it made for a refreshing drink. 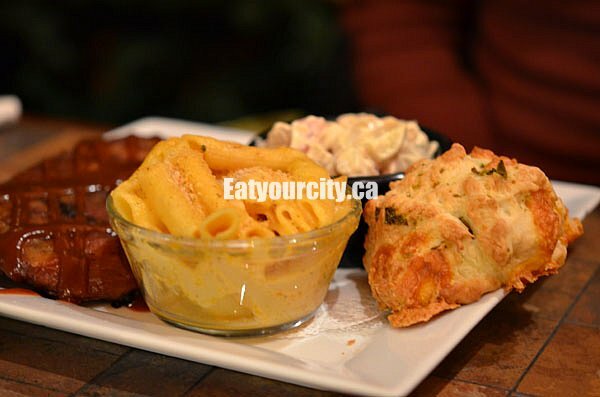 Most entrees came with a choice of salads - potato or green, rice or macaroni and cheese. We mixed things up a bit so we could try them all, except for the rice... next time... I still wanted to save room for dessert! My sides were served with my meal, so next up was the infamous Vi's Chicken Pot Pie. Simply done and deliciously savoury, this was soul food. A light creamy base of carrots, peas, large chunks of chicken, celery, thickened with potatoes and a light smattering of herbs forms the base. 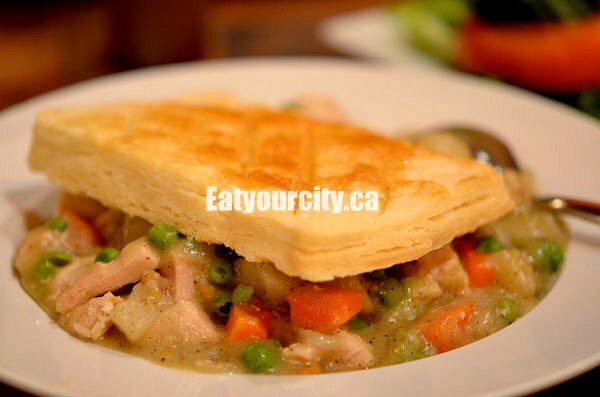 The pot pie is crowned with a large square of puff pastry - light enough to be airy and crisp, yet dense enough it doesn't shatter and get all soggy while the meal progresses. And with portion sizes being so large here, we really had to have will power not to just stuff our faces and forget about dessert. I know, blasphemy! But you gotta try it for yourself. Nom! 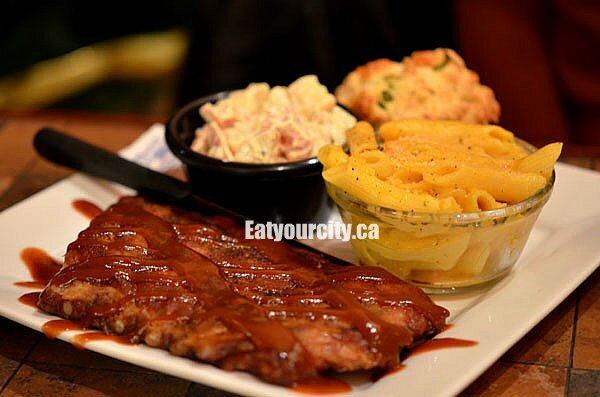 Next up was my platter of Applewood smoked ribs. They had smoked brisket (over pecan and mesquite) that they do daily, but again the lack of tummy real estate made me go with the ribs, and I wasn't disappointed. The slow smoking infused the meat with plenty of smoky goodness, and as the ribs were trimmed of their fat (thanks for thinking of your customer's arteries! ), they were a bit dry on their own. 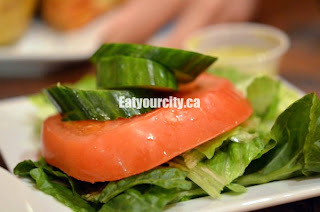 But nice and moist with the slightly sweet and tangy in house made BBQ sauce doused with. What about my sides? Don't worry, didn't forget them. Just got distracted by the totally AMAZING jalapeno and cheddar scone/biscuit that came with the ribs. Wicked buttery, soft and ooh so cheddary... mmmm! We picked up a few more after our meal for breakfast the next day. The mac and cheese were penne pasta tossed in a light creamy bechamel sauce and cheese - cheesey, but I prefer my mac and cheeses with lots of ooey gooey melted cheese. The potato salad was a tangy delight with small potato cubes and lots of diced pickles and pickling liquid added to the mayo to give the potato salad lots of brightness and salt. nomnomnom! 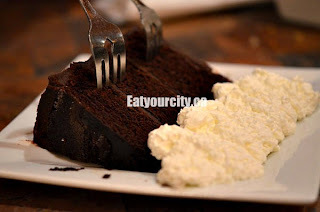 Moist layers of slightly sweet soft, yet oh so satisfyingly dense chocolate cake is layered with thick coating of dark and creamy chocolate fudge disguised as chocolate ganache, lending just enough sweetness that it didn't over power the cake. And the cake was finished with chocolate shavings. Hello my preciousssss! 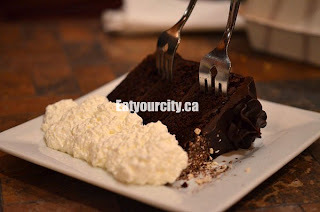 Yes, I know there are two forks, but my boyfriend let me eat most of it... maybe it was because he didn't want to get between a female wielding something sharp and a slice of decadent chocolate cake. I'm dating a smart man. Mmmmmmm! Overall, a great quaint little place that's been around for ever for simple and yummy homestyle fare, and of course... save room for their awesome desserts made fresh daily.